The latest model of the Shiver series has new and fresh side panels, side covers, front mudguard, and tail fairing, making the bike look aesthetically muscular. Aprilia wants the bike to look like a non-conventional naked sports bike. Although the exhaust has seen a facelift, it is still under the saddle of the bike. As a result of this, the Aprilia Shiver 900 side view is clean and exquisite. The Aprilia Shiver 900 has a brand new Kayaba fork with spring preload and adjustable hydraulics. The chassis is the same as the Shiver 750. The frame consists of steel tube trellis and aluminium side plates. The wheel rims make the rear and front lighter by 1.3 kg and 0.9 kg respectively. As a result of this, the gyroscopic effect reduces, making the bike agile. The seat height is at 810 mm, making the bike a joy to ride in the city and on open roads. 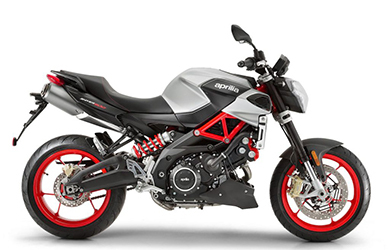 Aprilia Shiver 900 comes with the Marelli 7SM ECU, a significant upgrade over the ones used in the older models. As a result of this, the electrical system is simple as there is one ECU in charge management systems and engine control. Also, the traction control is more refined as it has four-levels. The front brakes are 4-pot radial callipers while the rear is a single piston calliper. The ABS of the braking system has two channels, giving the rider maximum precision while braking. The Aprilia Shiver 900 also has Bluetooth integration. The tank size is 15 litres and has a range of 158 miles. Unlike the earlier models which had 750 cc, the new Aprilia Shiver has a 900 cc, V-twin, liquid cooled, four-stroke, Euro 4 engine. Aprilia increased the stroke length by 11mm, producing more torque at the mid-range. As a result of this, the response while exiting corners and accelerating is much better. According to Aprilia, the Shiver 900 produces 95bhp at 8750 rpm and torque of 66 lb-ft at 6500 rpm. The efficiency of combustion is higher than the previous models because of the new injectors. There is a 6-speed gearbox with a new and lighter clutch. The new clutch takes 15% lesser load when compared to the older models. It is easier to start the bike during lower temperatures because of the automatic decompresser. For a base price of £8,002, the Aprilia Shiver 900 is one of the best middleweight naked sports bikes. The bike is a good all-rounder as it is well equipped. Handling is lightweight and brisk, and it is comfortable to ride the bike. The new aesthetics look stunning while maintaining a clean side view. Overall, the Aprilia Shiver 900 is a solid naked sports bike!